1.) The first day of Summer was June 21st…how did you spend it? 2.) The last movie you saw in a theater. 4.) Create a summer play list and share it. 5.) Talk about a club from your childhood you belonged to (or wanted to belong to). I actually forgot that Saturday was the first day of summer until later in the week. Our 5th wedding anniversary was Friday, so we went out to eat. 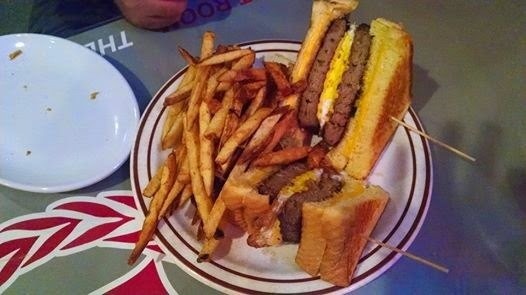 My husband got a double Falcon burger, which was 2 5 oz burgers with cheese and a fried egg between 2 grilled cheese sandwiches. He's not a fan of facebook, but he was so excited about this burger that he told me to take a picture to post! 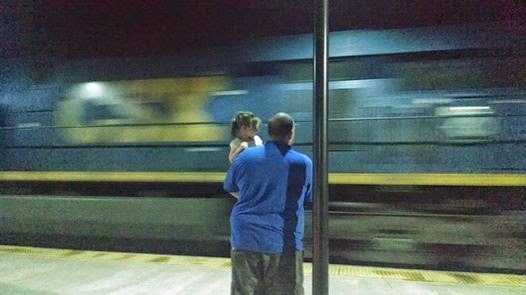 and took Aly to the train station when we heard the train whistle blowing, because she is crazy about the train. Apparently, my husband walked away with scratches. The first train scared her, but she lost her mind when the Amtrak rolled in. The next day was June 21 and I forgot it was summer! I had a breastfeeding class at the hospital that morning and left feeling more empowered and hopeful for a better time with this baby than with Aly. After I picked Aly up at my mom's, we went home and napped. Later we went to my mother-in-law's house for her birthday, but she forgot to make herself a birthday cake, so no cake. Next year, I hope I can remember to take a pause to celebrate summer! Maybe some park time, watermelon... mmmmmmm..... I can't believe that it is almost July! It feels like it was just winter!! !